The 23rd Golden Rooster and Hundred Flowers Film Festival wraps up today in Lanzhou, capital of northwest China's Gansu Province. As the oldest and most authoritative film festival in the country, it is expected to build a cultural exchange platform for the city. The four-day film festival has featured a promotion of China's new films and a display of international releases. 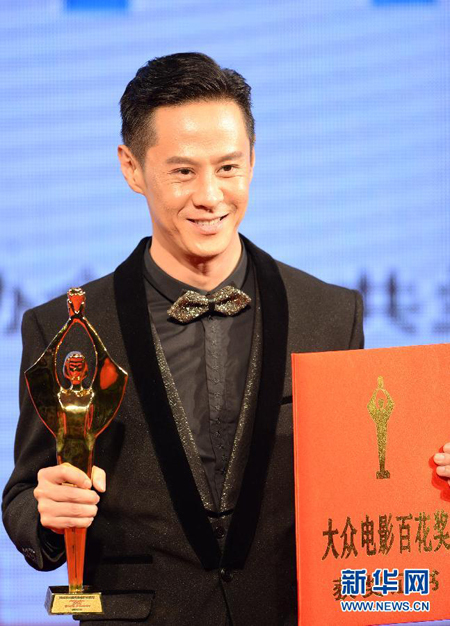 There has also been a display of Hong Kong and Taiwan films, forums, and an award ceremony. "Four movies that have been shown are award-winning Hong Kong films. I'd like to make a special recommendation for the movie 'An Autumn's Tale', starring Chow Yun-Fat and Cherie Chung. It was a very successful movie, and audiences shouldn't miss it," HK film director Ng See-Yuen said. The nominating committee has also received opinions from film fans, who cast their votes online and through mobile apps, as well as through traditional channels, representing an innovation at this year's gala. "The most important thing is to understand the historical development of Chinese film, culture, and the nature of our country. Never go off the track of our Chinese own characters to mimic others, like the Hollywood style, and let Chinese audiences learn to appreciate our own productions," art critic Zhong Chengxiang said. The 10 films nominated for the Golden Rooster and Hundred Flowers Award were chosen by 100 cinema managers, who reviewed more than 100 films that premiered between March 2012 and February 2014. The 23rd Golden Rooster and Hundred Flowers Film Festival wraps up today in Lanzhou, capital of northwest China's Gansu Province.